The team at L & M Tree Service knows there are a few simple ways to tell when it’s time for tree thinning. Their knowledge stems from over 25 years of experience helping people throughout Kalispell, MT, remove weaker trees from their properties to give healthier ones room to flourish. Do A Walk-through: One of the simplest ways to tell if it’s time for tree thinning is by walking through the property. If you can’t navigate the landscape easily, it’s likely time to remove a few unwanted trees. To determine which trees are unhealthy and need to be removed, scrape bark from twigs or branches and examine the tissue. Healthy trees will have moist, green tissue. If the tissue under the bark is dry, trees could be dead. To know for sure, call L & M Tree Service for help. Examine The Crowns: Checking tree crowns is also a simple way to determine how often you should do tree thinning. Crowns are the portions of trees covered by live branches. If you spot several trees with small crowns, they are competing with healthier trees—those with larger crowns—for nutrients. Remove trees with smaller crowns so that healthier ones have room to stretch and grow. Ask An Expert: If you’re not sure if it’s time to remove weaker trees from your property, just ask an expert. 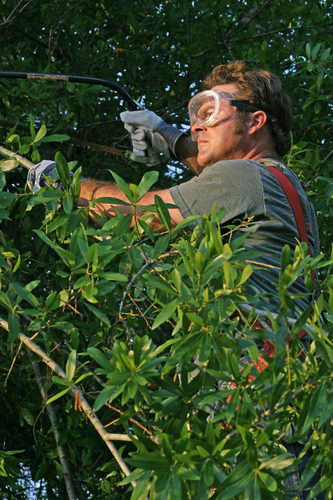 The folks at L & M Tree Service are well-versed in all aspects of tree care. They will measure the diameter of the trees at breast height and calculate the ratio of the crown to the tree height. After taking measurements, they’ll use state-of-the-art equipment to provide tree removal. For expert tree thinning, call L & M Tree Service. Beyond thinning out your forest, the trained team will also provide tree trimming, stump grinding, emergency tree removal, and anything else needed to keep your landscape healthy. To schedule a service appointment in Kalispell, call (406) 261-7240 to speak with a representative. Visit L & M Tree Service online to discover how they’ll care for your trees.